Would you like to remove the default image compression that WordPress applies to your uploaded images? WordPress automatically applies image compression to each image uploaded to your site. This tutorial will walk you through how to turn off image compression with the use of a plugin we will create. This tutorial is a bit more technical than our other docs, but we’ll walk you through the process step by step. In order to remove image compression, we’ll need to create and upload a basic WordPress plugin. To remove WordPress Image Compression, just add the following code to a new file at wp-content/plugins/envira-remove-wordpress-image-compression.php. Next, copy and paste the code shown above into the file and save the file as envira-remove-wordpress-image-compression.php. Your next step is to activate the plugin you just uploaded. 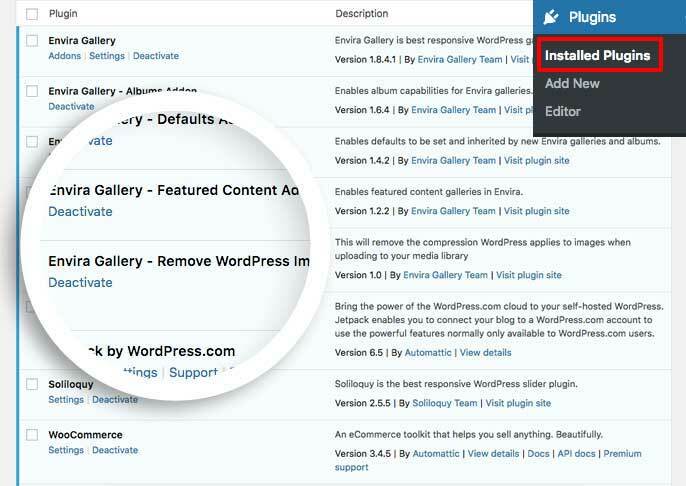 Simply navigate to the Plugins from within your WordPress dashboard and activate the Envira Gallery – Remove WordPress Image Compression plugin. After activating, any new image uploaded will no longer be subject to WordPress’ image compression! Note: any image that was previously uploaded to activating this plugin will need to be re-uploaded to have the compression removed. That’s it! Would you like to extend Envira further? Check out our tutorial on how to Remove Fragment Cache from Envira Gallery.